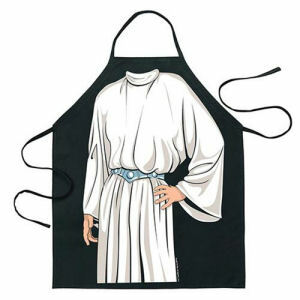 We have Just Sold out of Star Wars Princess Leia Be the Character Apron. This Item is unavailable at present. From the Star Wars collection by ICUP. Star Wars Princess Leia Be the Character Apron. One Size Fits Most! Size: 27in W x 31in H (68.5 cm x 79 cm), 24in (61 cm) neck loop, 33 in (84 cm) waist tie. ICUP Star Wars Attire shipping from Canada. No Surprise Border fees or Customs!